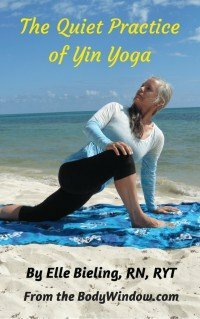 I was to deepen my yoga practice by enhancing my body-mind connection through this "new" way to practice, called Yin Yoga. Yin yoga is slowly gaining recognition and popularity. For me, it is the "true" yoga, the quiet, held, opening aspect of discovering the secrets of your body-mind-soul. It is where you can go deeply into all aspects of yourself, through your body and see what is there. It is your access to yourself through your Body Window. My story regarding how I came upon yin yoga, is nothing short of destiny. Once in awhile, the stars line up perfectly and a path opens that one just cannot doubt is their true path. While spiritual gurus have taught me that guidance is everywhere, if I am just willing to look, obvious guidance is often an infrequent happening in my life. Even though I am getting better, I usually need to spend lots of time in meditation and contemplation to get what it is I am supposed to know. This time was different. It was special. It all began when I decided that I wanted to deepen my personal experience of yoga. Without any doubts, I knew this needed to be done through more training with those more experienced than I. My first 200-hr yoga teacher training left me with more knowledge, but not a deeper practice. What I learned was the mechanics of the poses, but not much more. I spent lots of time researching various 500-hour yoga teacher trainings. I considered yoga therapy, since I prescribe yoga meditations already for my clients in my holistic coaching practice. Yoga therapy intrigued me a lot, but it still felt too illness-based for me. I didn't want to focus on disease - I had plenty of that as a registered nurse. Instead, I wanted to experience a deeper, meditative yoga using the body-mind connection. In other words, how does one experience the spirituality of the body to connect even deeper to oneself? What did it mean for me to have a deeper yoga practice? Was there more to it than I had experienced? I already had a deeply spiritual, contemplative and personal yoga practice. This yoga at home practice was between me and God. It is what keeps me feeling alive, well and at Peace with myself. Yet, I still wanted more. Recently I had a wonderful training with Matthew Sanford, a paraplegic yoga teacher, at Samadhi Yoga, a Denver studio. It was unbelievable to me, that a person without physical sensations could teach me more about the spiritually of the body, than my "feeling" instructors. The training was fabulous and for the first time I felt that I was learning more than I already knew about the spirituality of the body. As a result of this training, my personal yoga practice and the yoga classes that I taught were upped a notch. Hope was sparked in my heart that I would find the necessary teacher(s) to deepen my personal yoga practice even further. I happened to notice that Samadhi Yoga was offering a 500-hour yoga teacher training for the first time in their history. This was exciting, because I would be able to study locally. I eagerly read their syllabus, and I loved everything about the description of the training. I applied and interviewed with the coordinator of the program. It seemed like a perfect fit, and I was accepted into the program. I loved the titles of the training tracts, "Embody Samadhi." I was physically fit and ready to start the training within a few months. I felt at peace with my decision. At the studio, I gave them my credit card and paid for a large portion of the training. Soon after applying to Samadhi, I had my periodic physical examination with my traditional nurse practitioner. She recommended a bone scan as a screening device for osteoporosis. I have a family history of this and I was 55. It was time to think about starting periodic screening. I agreed to the test. Several days after the exam was completed, I received a call from the doctor's office, stating that the bone scan showed that I had osteopenia, or early osteoporosis of my hips, and actual osteoporosis of my lumbar spine. I was stunned. My feelings of shock soon succumbed to horror! I am extremely active, very conscious of my diet and quite healthy and fit for my age. How could this be true? As I started to research osteoporosis, and yoga, I was even more horrified to learn that due to compression on the spine, the forward folds were not recommended for someone who has osteoporosis. Continuing forward folds could compress the spine further and cause more damage. I was devastated. The forward folds are my favorite, surrendering and introspective poses in my personal yoga practice. How could I now go through an intensive 500-hour teacher training program, if I could no longer participate in some of the basic poses? Everything I thought I believed about myself and the health of my body came crashing down! I had made my decision to enter this program based on my physical health and strength! For the next several days my emotions were a mess. I would feel disbelief, tears and horror. Then I would feel release, surrender and acceptance. Then I would return to the disbelief. I would alternate back and forth between the two sets of feelings. What was I to do about my future training that I had already paid for? What did this mean for me as a yoga teacher? Was I only going to be able to do adaptive yoga classes? Did I need to become like Matthew Sanford, teaching from a perspective of disability? Well, if he could do it, so could I! One of the roller coaster days I decided that I was too distraught to do my yoga practice at home. I wanted to go to a new class at Samadhi that I had never heard of, called Yin Yoga. Just before heading out to class, my sister called, and I had a long and cathartic chat about what I had discovered. As we were saying goodbye, I glanced at the clock. I would have to hurry to make it to class on time. I said to myself, oh well, you're not going to make it. But something inside me said, "Go to class." I wanted to ignore it, because I hate hurrying and arriving at a yoga class late is taboo. But the strength of this feeling that I needed to go bothered me, so I hurried up to make it just in time. As I was getting ready to settle on my mat, the sweet, young studio receptionist came rushing into the room and told me that she needed to swipe my credit card again, that for some reason it didn't go through when I paid for my 500-hour training. What? I was motionless for a moment. My credit card didn't go through? It took me a while to get my bearing as my mind was trying to process the information. I was off the hook! I didn't have to go begging for my money back. I just felt the tears well up in my eyes and I responded to her that I needed more time to make my decision. I was crying by the time I got out the facts that I had just had a bone scan done and it showed osteoporosis. By now, the yin yoga teacher that I had not yet met, was over by my side, supporting me. Of course, the sweet, young receptionist, was kind as I told her that I would have to discuss the matter further with the training coordinator. My yin yoga class began that day, with me an emotional wreck. I melted into the mat. As I was instructed on this "new" type of yoga practice, I realized that I was coming "home" to my body. This slow, intuitive and introspective style of yoga was just what I needed. I have always been fond of Iyengar-style yoga, with their longer held poses and emphasis on alignment and intuitive refinement of the pose. I always appreciate the inner strength that it takes to fully experience a yoga pose by holding it and settling into your body through your flowing breath that reduces the effort required. Yin yoga was very, very similar. So what is yin yoga? The difference being that most of the poses are done on the floor, they are held for even longer, about 3-5 minutes, and they work deeper into the connective tissue, joints, fascia and ligaments. This deeper work only is possible as the yoga practitioner learns to release the muscles. This was the type of yoga practice that I was secretly doing at home. It was always the type of practice towards which I was intuitively drawn. This was truly yoga for healing. It was about moving into the edge of myself, moving into the aches and emotions, and allowing their full release through my body. It was a wonderful day of discovery that day, and a wonderful yoga practice. This is what yoga is all about. I couldn't believe that studios were now offering this type of yoga practice! It is touted as being "new," but my understanding of yoga from all that I had read and experienced, was this was how it was supposed to be! After class, I eagerly talked to my new teacher, Elise Fabricant, to ask where she had gotten her training. We chatted for some time about the possibilities for my future. She was also very excited for me. She was so compassionate and helpful that day! (And still is!) Through her lovely influence, and my pull to go to her class that day of distress, I came to know of Sarah Powers, founder of "Insight Yoga." This was to replace my 500-hour training at Samadhi. I knew without a shadow of a doubt that it was meant to be. As I reflected on my "condition" of osteoporosis over the coming weeks, and educated myself more on the subject of diagnostic bone scans, I came to realize that the margin of error with this particular study is actually quite high. This was compounded by the mode in which it was administered to me, via a portable unit in a van, parked by the doctor's office. Since the test can only compare with averages, without having done a baseline at a younger age, how would I know what was normal for me? I declined my care provider's offer of medical treatment through a prescription, and instead educated myself once again, on the foods high in calcium. I increased these foods in my diet. I continued my daily 1-2 miles walks with my dog, my daily yoga practice, and the occasional high-intensity outdoor activities that I am so fond of. I spoke with an acupuncturist who assured me that sufficient calcium can be obtained through diet alone. I listened to my sister who is also in the medical field, working in a doctor's office, to be wary of calcium supplements, since they are linked to heart disease in women. I reflected more on my very active lifestyle, and found it hard to believe that I could possibly have osteoporosis, with all the weight-bearing exercise that I do. I had never felt any pain or problems in my personal yoga practice, so I questioned how I could possibly be hurting myself with the forward folds. I would continue to do what I loved. I held my "condition" in my heart, and decided that in one year's time I would repeat the bone scan. If my spine stayed stable, then most likely, whatever the test showed may be my normal baseline. The test is measured against the "average" person anyway, and I am certainly not average! As I reflect on the events that totally changed my yoga path and my yoga practice, I remain in awe. What were the odds that all these events would happen at the same time? What were the odds that my credit card wouldn't go through? That had never happened to me before. A day or so later, I knew that this machine's "mistake" was a true Gift of God. I now even see my "osteoporosis" as a gift as well. Without that diagnosis, I would never have found yin yoga. I would not have known about it at all. In fact, I believe now in my heart, that if I went back to repeat the bone scan that there would be no osteoporosis. Or that my spine will always be stable from this point forward and this is my baseline. I just know it in my heart. I will say it again...Guidance is everywhere! Open your own heart and your truth will be revealed to you. Trust others to help guide you. Trust others who have gone before you. Trust the "trail." Your path may not include a yoga practice, as mine, but you WILL find your true path!